"Seven thousand miles away, from my family, you took me in. And you loved me like I was your own son, or your own brother. Never have I felt more loved, in my entire life than the time I spent in the Philippines... I truly believe that every single Filipino heart was carefully designed and created by God with the purpose of spreading more love throughout the world." 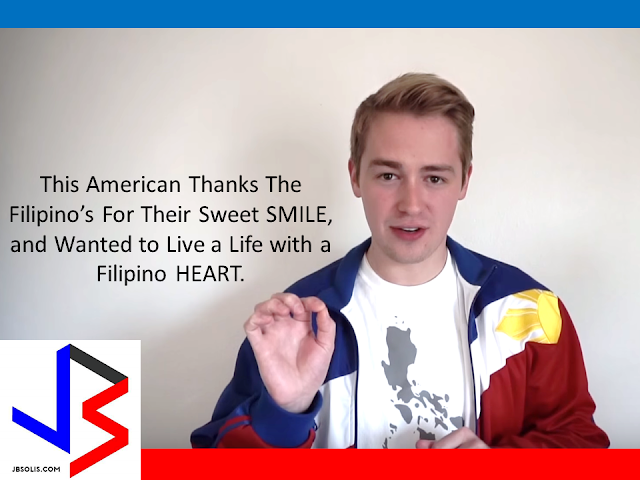 One of the members of a popular entertainment group, known as Hey Joe Show, gave tribute to the Filipinos citing the wonderful values and hospitality that he witnessed while living in the Philippines. Tyler served as Mormon or LDS missionary in the Philippines for two years. In his tribute he mentioned that the first thing he would remember when he arrived in the Philippines is that "every single Filipino smiled" at him. Filipinos are known for being hospitable to their visitors. As a missionary in the Philippines, one of the best things he observed is the hospitality. Tyler said, his stomach was always full. The number of times he was fed by many wonderful Filipino families cannot be counted anymore. According to him, Filipinos are so kind, and gracious that even if it was the last cup of rice it will still be offered and given to him with a smile on the face. Not only did he mentioned the experiences he had as missionary. He was in the Philippines at the time of typhoon Yolanda and during the earthquake that devastated Bohol. During that time, he was so astonished at the positive outlook of many affected Filipinos who still managed to smile with hope that everything will be alright. His tribute also mentioned the faith of many underprivileged Filipino families, who according to him managed to live with just one candle in their homes but could still praise God and have hope for another day. One of the best thing that perhaps we should be proud of is the pure love that he witnessed while living in the Philippines. Miles away, Mormon missionaries have to serve mission and sacrifice being far from their families for a period of two years. They get to call their parents only on special occasions like Christmas or Mother's Day. But, according to him many families welcomed him and treated him as own son or own brother. In which he never felt more loved. The group connected with many Filipino fans not only because of their fluency in Bisaya language but also with their funny videos and as they try to adapt and depict Filipino customs. The Hey Joe show is comprised of five members who all served as Mormon missionary in the Philippines. They all speak fluent Bisdak or Bisaya-Cebuano. And they met President Duterte! In fact, the video below showed them giving their respect to President Duterte through the traditonal "mano", instead of handshake as you might do ,if you met the President. They also had a video with him dancing.